During the past month of surging market volatility and spectacular, confidence-sapping rollercoaster moves in the S&P, the one backstop bullish market commentators have used time and again is that Q1 earnings season will be spectacular, an offset to all other bad news. And, indeed, thanks to the passage of Trump's corporate tax cuts in late Q4, analyst estimates for first quarter earnings have been revised higher by the most on record amount. According to Factset, the Q1 bottom-up EPS estimate has increased by 5.4% (to $36.24 from $34.37) during this period. On a year-over-year comparable basis, expectations for Q1 profits have risen from an expectation of 12.2% growth on Jan. 1 to 18.4% now, an increase of 6.2% as analysts have factored in the new tax law. How significant is a 5.4% increase in the bottom-up EPS estimate during a quarter? How does this increase compare to recent quarters? On average, the bottom-up EPS estimate usually decreases during a quarter. During the past five years (20 quarters), the bottom-up EPS estimate has recorded an average decline of 3.9% during a quarter. During the past ten years, (40 quarters), the bottom-up EPS estimate has recorded an average decline of 5.5% during a quarter. During the past fifteen years, (60 quarters), the bottom-up EPS estimate has recorded an average decline of 4.1% during a quarter. In fact, Q1 of 2018 has marked the largest increase in the bottom-up EPS estimate during a quarter since FactSet began tracking the quarterly bottom-up EPS estimate in Q2 2002. The previous record for the largest increase in the bottom-up EPS estimate was 4.8%, which occurred in Q2 2004. ... even the smallest disappointments could add to further upset the fragile market. 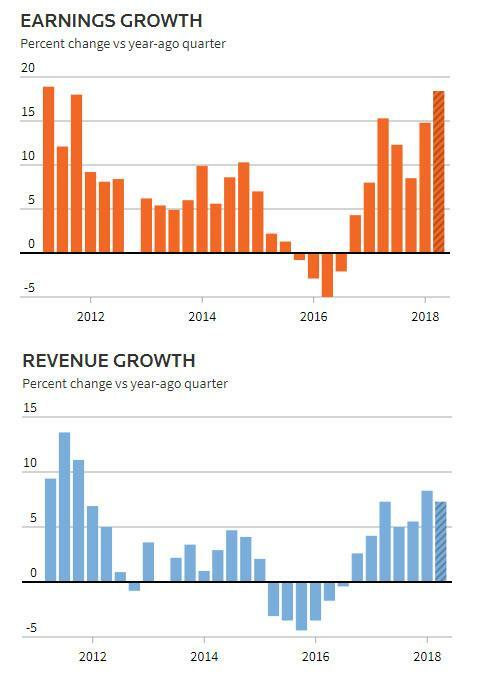 And as noted above, investors have counted on corporate profits - the standing silver lining to the broader market - to provide support as the market endured dramatic swings in recent weeks over concerns about a trade war with China, tougher regulations for high-flying technology companies, and growing retail outflows from virtually all asset classes. "There is an awful lot of pressure for corporate profits in this first quarter and especially the guidance the companies are going to give to really get this market back on its upward track," said Chuck Carlson, chief executive officer at Horizon Investment Services in Hammond, Indiana. Here are the number that are priced in: S&P 500 earnings are expected to rise 18.4% in Q1 according to consensus estimates in the first full quarter since passage of President Donald Trump's tax cuts, which slashed the corporate tax rate to 21 percent from 35 percent. That would be the biggest profit rise since the first quarter of 2011. Bank of America, meanwhile, has a far more cheerful outlook on Q1 earnings season, and tells clients that "1Q EPS should positively surprise despite record revisions." 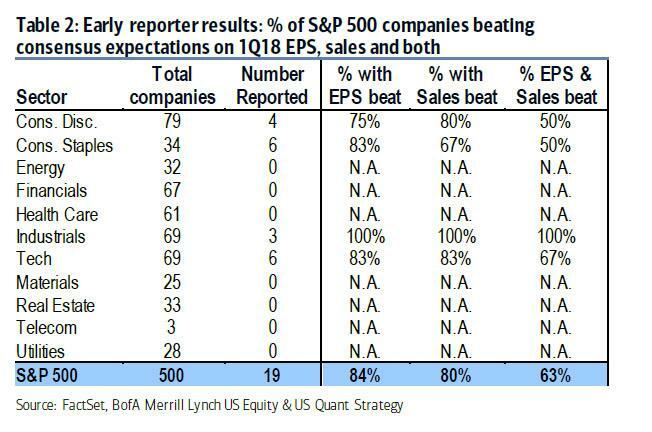 1Q18 earnings season kicks off next week, with 7% of S&P 500 index earnings slated to be reported. 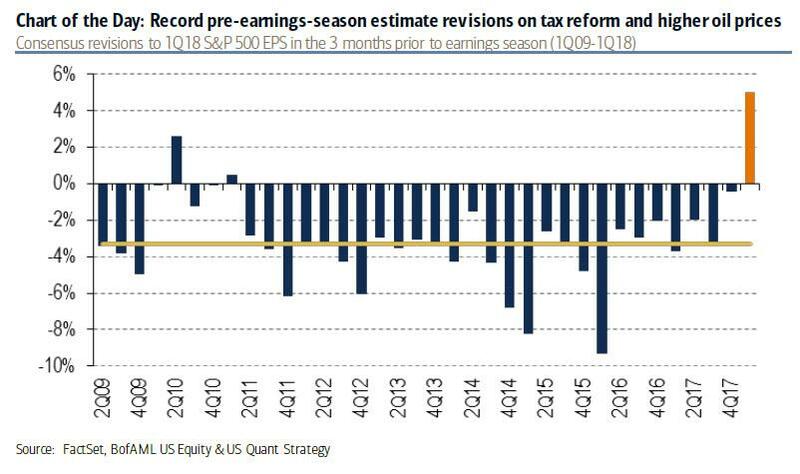 For the first time since 2011, quarterly EPS has been revised up in the months leading into earnings season (a post-crisis record as shown in the chart up top) as analysts have revised up forecasts on tax reform and higher oil prices. This compares to a typical pre-EPS season cut of 3-4%. Analysts expect 1Q EPS of $36.17, up 17% YoY, a pickup from up 15% in 4Q17, which was the best growth in six years amid a quarter of record top- and bottom-line beats. Analysts expect EPS growth to peak in 3Q18, before slowing through year-end. This could benefit value stocks in the near term, which typically outperform when profits are accelerating. Our EPS forecast of $36.50 implies a modest beat, supported by early reporter results, guidance trends, and macro data (more detail inside). Analysts expect sales growth of 7% YoY (vs 9% in 4Q, a six-year high). Dollar weakness will again be a benefit: we estimate FX will contribute 2.5ppt to 1Q YoY sales growth, the biggest FX tailwind in six years. Oil prices should also remain a tailwind: WTI oil averaged $63/bbl in 1Q, +22% YoY, and +7% over the course of 1Q. Excluding the benefits from FX and oil, analysts expect S&P ex. Fins. & Energy constant-currency sales growth of +5% YoY vs +7% YoY last quarter. While earnings revisions have been outpacing sales revisions due to tax reform, sales revision trends are still near record levels (and the strongest since 2004). This presents a further downside risk according to Keith Lerner, market strategist with SunTrust Advisory, who said that "a downside risk is that everyone is hoping for the earnings to come through and that is really a main pillar for the bull case," said "And if earnings surprise to the downside then you have to say, what is the bull case hanging onto at this point?" Goldman's David Kostin agrees, and warns that "the reward for EPS and sales beats will be limited this quarter, but the downside risk for misses will be substantial. Strong expected earnings growth and positive revisions have supported the S&P 500, offsetting an 9% contraction in the forward P/E multiple to 17x. Positive 1Q surprises would confirm investors’ existing confidence in corporate fundamentals. However, if 1Q results disappoint, fears about decelerating economic activity will compound mounting concerns around trade, regulation, and stretched positioning." The good news is that for now, at least, the whisper number appears to be attainable: very early returns indicate first-quarter results show similar positive surprises to past quarters, and of the roughly 2 dozen S&P 500 companies reporting so far, 74% have reported profits ahead of raised estimates, a number that is 10% higher than the 64% of companies that traditionally beat quarterly estimates. According to Factset, the number is even higher: 84%. So what should investors look forward to in the immediate future? Seven S&P 500 companies are expected to report next week, when earnings season begins officially, starting with the traditional early reporters, financials such as BlackRock, the world's largest asset manager, and three big banks: JP Morgan, Citigroup and Wells Fargo. More than 60 S&P 500 reports are due the following week. Courtesy of the sharply upward revised earnings estimates, forward multiples have tumbled, which as Reuters adds is one cushion for investors, as companies are now trading at less expensive valuations following the market's slide. Putting it in perspective, the S&P 500 recently traded at 16.3x forward EPS, down from 18.6x in January. Of course, there remains a growing risk that either trade war or some other unexpected event - perhaps even a recession - will lead to a sharp drop in corporate profits in 2018, resulting in a spike in forward PE multiples, making stocks quite expensive again. For now however, the future is bright, and for the full year 2018, S&P 500 corporate profits are expected to increase by 19.7%, which would be the biggest annual rise since 2010. Just as important as the actual earnings, in their conference calls company executives will give much needed internal forecasts and insight into their prospects for the year, a far more objective perspective than the traditionally biased, and chronically bullish Wall Street outlook. Here some strategists have said recent policy and market turbulence could lead companies to temper their views. “Given the uncertainty that is in the market, especially regarding trade and potential tech regulation, we could see management teams be a little more cautious,” said Lindsey Bell, investment strategist at CFRA Research in New York. The three-month ratio of above-consensus vs below-consensus management guidance has come off its late-2017 peak, but at 1.1x, is still nearly double its long-term average of 0.6x. While guidance was sparse in March (as is typical in the last month of the quarter), the one-month ratio of 0.9x was also above the historical March average of 0.7x. In addition to “hard data” (guidance), “soft data” (management commentary) is also supportive of continued strength in earnings: mentions of “better” relative to “worse” or “weaker” on 4Q17 earnings calls were at an all-time high in our data history since 2003 (Chart 10), and mentions of optimism were well above average (Chart 11). Of course, record high optimism euphoric expectations mean just one thing: that probability for a dramatic disappointment has - by implication - never been higher. In that vein, BofA has compiled a quick screen of which sectors to own this earnings season purely on the basis of EPS and sales revisions, as well as guidance and market responses. 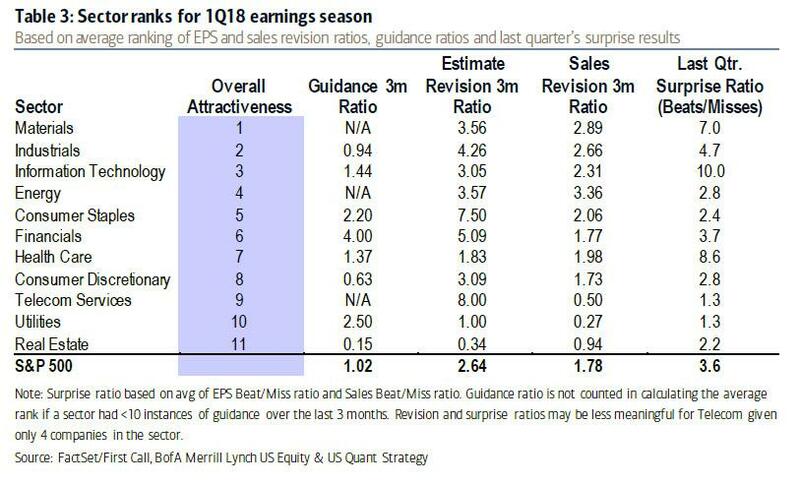 As BofA's Savita Subramanian writes, "historically, we have found that sectors with strong EPS revisions, sales revisions and guidance have been more likely to have a greater amount of earnings beats than misses in the subsequent earnings season." Also, given positive surprises tend to persist, sectors with a higher ratio of positive to negative surprises in the previous quarter may be more likely to enjoy similar results in the current quarter. Each quarter, we have ranked sectors by these measures, and for this earnings season we found Materials and Industrials screen as most attractive, while Real Estate and Utilities screen as least attractive." So for those who believe that past performance is indicative of future returns, should put on a pair trade where they buy materials, industrials and IT while shorting real estate, utilities and telecom.